Connecticut sent six resolutions from our annual session to National Grange for action. Two of them were withdrawn as they already were considered National Grange policy. The other four were discussed, with two of them being adopted by the delegates and are now part of National Grange Policy. One was the resolution concerning setting standards for minimal walk light times, types of visual image and audible sound levels for road crosswalks. The second one was to continue to uphold the State’s rights to regulate farmers transporting of equipment and not requiring them to obtain CDL licenses to operate farm equipment. These were resolutions that came from you and went through the Grange process from local Granges, to Pomona, to State then on to National Grange. Good job everyone!!! The Legislative Committee is going to put together a resolution writing workshop for anyone interested in writing resolutions. One of the items in the Honor Grange report is to submit a resolution to your Pomona Grange. We are planning on holding at least two workshops in different areas of the state in the spring. This may be something that could be presented at local Granges as well. Watch the Granger for more information on these workshops. The Legislative Committee is putting the final touches on the 2012 Legislative Guide. This is the State Granges Legislative policy guide and copies will be sent to all members of the General Assembly and to local Granges. The 2012 Connecticut General Assembly convened on February 8th for the ‘short session’. This off year session is for budget adjustments only. There are other items that somehow seem to be considered budget that are brought up, but the budget is the primary focus. As Russell Gray mentioned in the last Granger, these state monies are important to towns. It is extremely important for towns and agencies that the state budget is passed within a reasonable time frame. As an example, the education systems need to know how much they are going to receive to set their budgets for student tuitions and programs. Remember, this money is ultimately coming from you, the taxpayers. We all should be aware of our state and town budgets and the process of adopting them. When your town presents its budget to the town’s people, review it and ask questions if necessary. Ask a Selectman or representative of the town to your meeting to educate you on the budget. Gordon Gibson will again be at the Capitol communicating the State Grange’s policy on the different topics. He will be monitoring budget recommendations for the Department of Agriculture and many of the Agricultural and Rural programs. We will again be posting his testimonies on the State Grange web site as we go along. 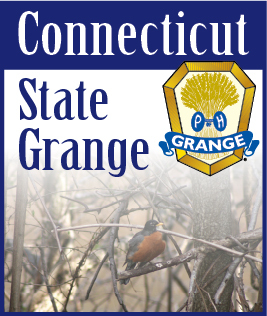 The State Grange Legislative Committee also has a Twitter page where we post events.